I’m not usually the type of person to book tours far in advance because I'm always changing my mind, wondering if something more exciting might come up. Luckily I can always look no further than my phone and Activiter for my next adventure. The freedom of deciding on last minute discounted tours is such a great idea that adds a ton of flexibility to my lifestyle. Case in point - I jetted to Lihue on a whim with my husband, catching an early morning flight one Saturday. 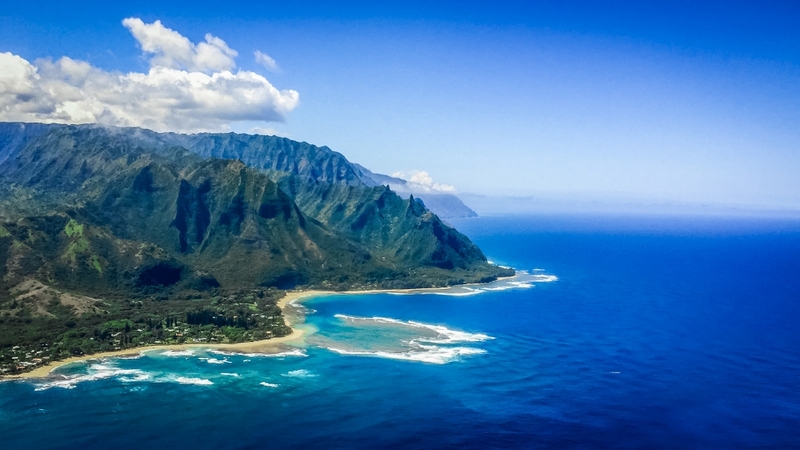 We arrived from Oahu and were ready to start exploring well before 8am, when I found myself asking… "why not jump on a helicopter tour of Kauai?" A few simple clicks through the mobile app and our bookings were made. The heli-pad was a convenient 5 minutes from the airport we had just arrived at…Lucky! That meant we even had time for a quick breakfast at Tip Top Cafe. After a short safety video and demonstration, we were airborne! From take-off you’re already impressed with majestic views of the Maluhia Tree Tunnel, Manawaiopuna Falls (the same waterfall the helicopters land at in Jurassic Park) and 'Opaeka'a Falls all within minutes of one another. Our pilot – the amenable Captain Brad – peppered the already amazing trip with fun and interesting facts, adding to the overall journey. Many of his stories were new even to me, a local, and I left with a newfound sense of respect for the Blue Hawaiian staff and their knowledge of the local history and culture. 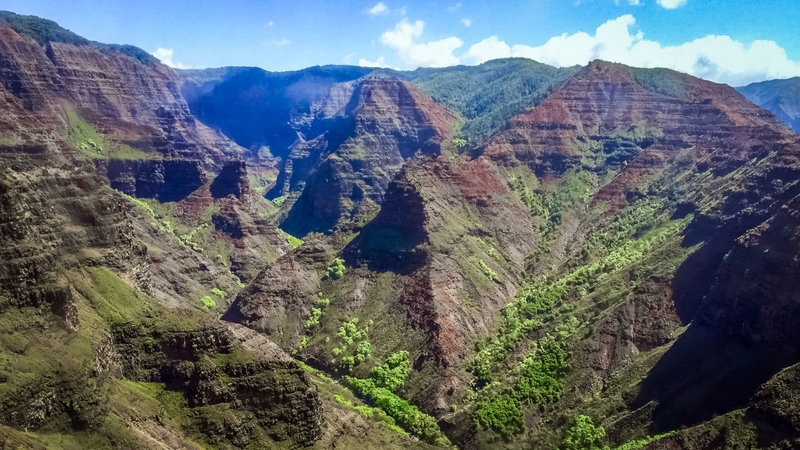 From two of Kauai’s iconic waterfalls, our helicopter adventure continued through the depths of Waimea Canyon. I’ve seen views of the canyon from both the lookout and the state park, thinking they were amazing, and they are. But this…this is even better! From here you truly escape into the wilderness, with sweeping valley views and endless waterfall sightings. We decided to stop counting after 10 and just enjoy the view. Soon, we were coming up on the famed Napali Coast, with views of the ocean stretching out as far as the eye can see. Only accessible by helicopter or boat, the vastly untouched scenery really takes your breath away. BONUS! Captain Brad spotted a whale offshore and managed to pass us safely right over the beautiful humpback! We hovered above without disturbing her for several breeches before we were forced to part ways. Heading back from the Napali Coast, we flew by Mt. Wai’ale’ale and the lush Bali Hai Cliffs. Once we touched down and I finally put my camera away, my head swirled as I tried to recount everything I saw – and realized it was the entire island! The experience made me appreciate seeing Kauai (or any island) by helicopter – it really is a remarkably efficient and AMAZINGLY scenic way to do it. And if you’re like me - wanting to pack every adventure possible on a trip itinerary - this is the perfect checkbox to add to the list. BONUS 2! Thanks to Activiter I did it at a discount! 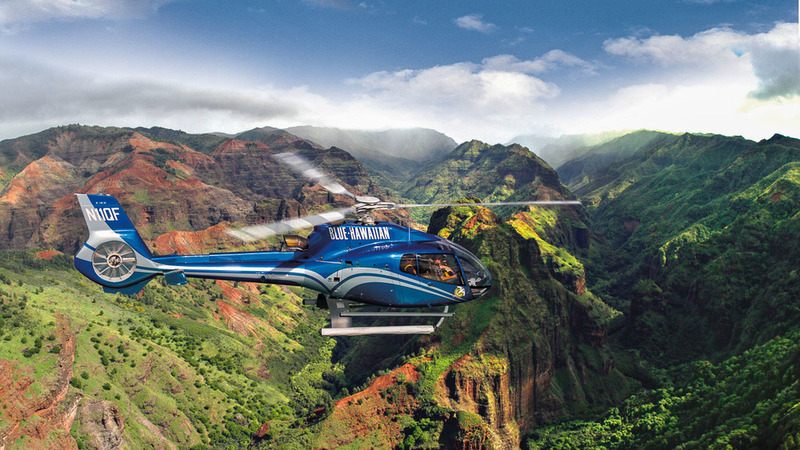 Truly inspired, I'm looking forward to booking my next last minute tour on Blue Hawaiian Helicopters for Maui, the Big Island and even… right here at home on Oahu! Older PostAll aboard the Mana Kai!